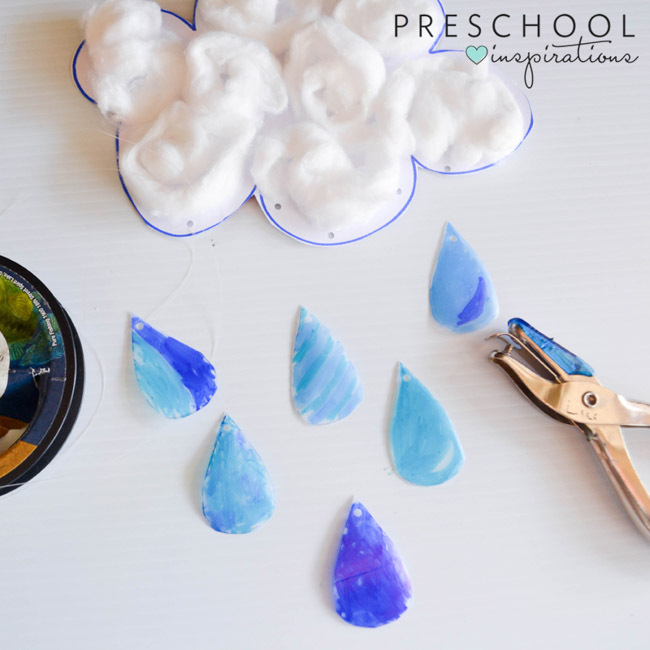 Kids can make a fluffy rain cloud suncatcher craft to celebrate April with their own rain shower. It looks great hanging from the ceiling and is the perfect addition to spring time crafting or a weather unit with your students. I love finding craft supplies in the recycle bin because it’s nice to teach the kids to reuse items, and it keeps crafting costs to a minimum. Milk cartons always come in handy. My favorite part about them is they are translucent, so light can shine through it while illuminating my kid’s artwork (I included a picture below so you can see for yourself). We made Stained Glass Butterflies using milk cartons and you can really see the colors shine through. 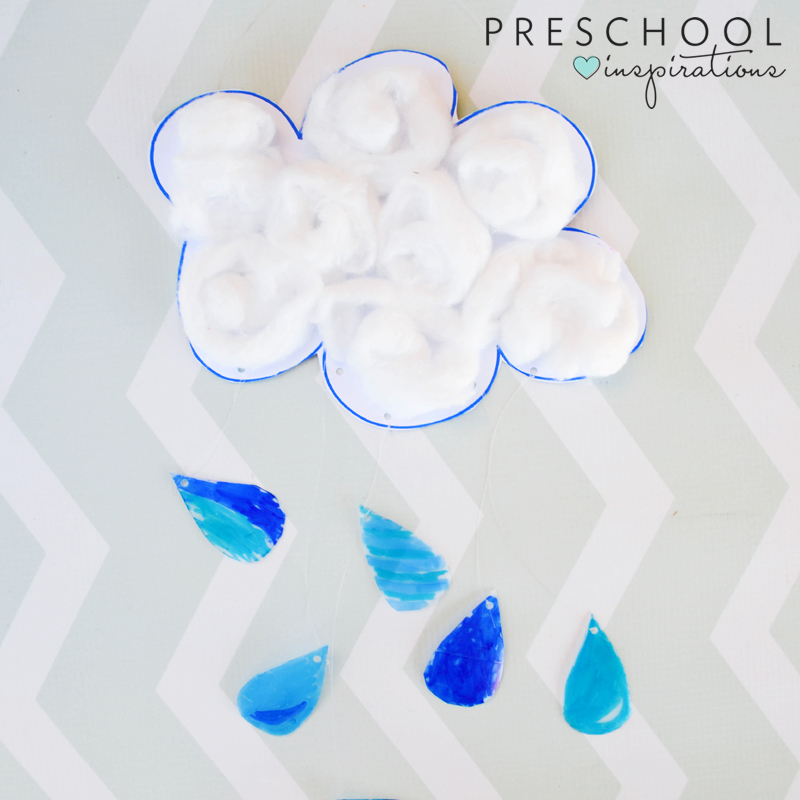 Start by letting your child draw a cloud shape using the white cardstock or paper plate. We didn’t use printer paper because it wouldn’t be strong enough to hold its shape while hanging. Have the child glue cotton balls onto the paper and set it aside to dry. Once dry, have her cut out the cloud shape with scissors. Cut out tear drop shapes from the milk carton. I did this part for my kids because the milk carton is difficult for their little hands to cut through. If you want to keep this craft 100% kid made, the kids can practice their scissor skills as they cut their own tear drops out of paper. 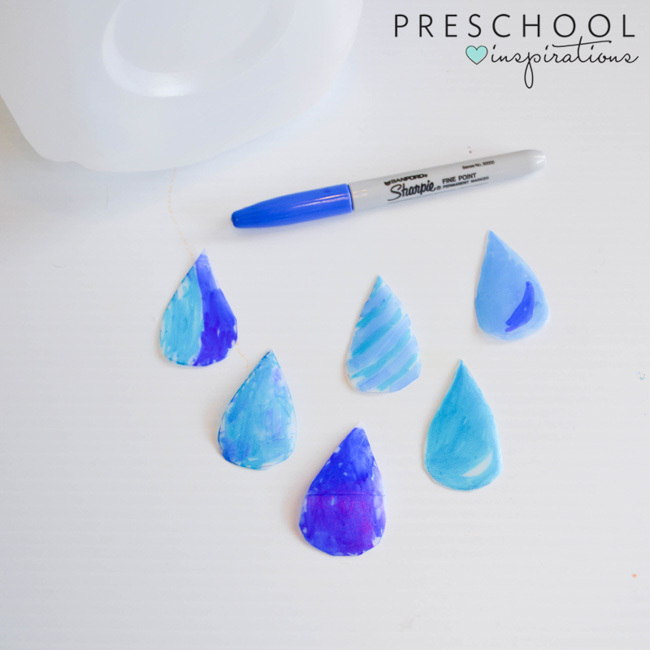 Let your child color the tear drop shapes with the blue permanent marker. We had a light blue and dark blue marker which my kids used to make different designs. Punch a hole at the top of each tear drop. I did this part for my kids. Secure fishing line to the top of each tear drop. Punch a hole for each tear drop at the bottom of the cloud. Attach each tear drop. We liked to make the fishing line different lengths so the tear drops rested at different levels. To display it, you can punch two holes at the top of the cloud and tie the fishing line at the top to make a loop to hang from. The great thing about spring is the weather is always changing. We hung our rain clouds near the window so that when it’s sunny outside the rain drops seem to glow like stained glass. You can even see a little color shine through on the background in our photo. Pretty! 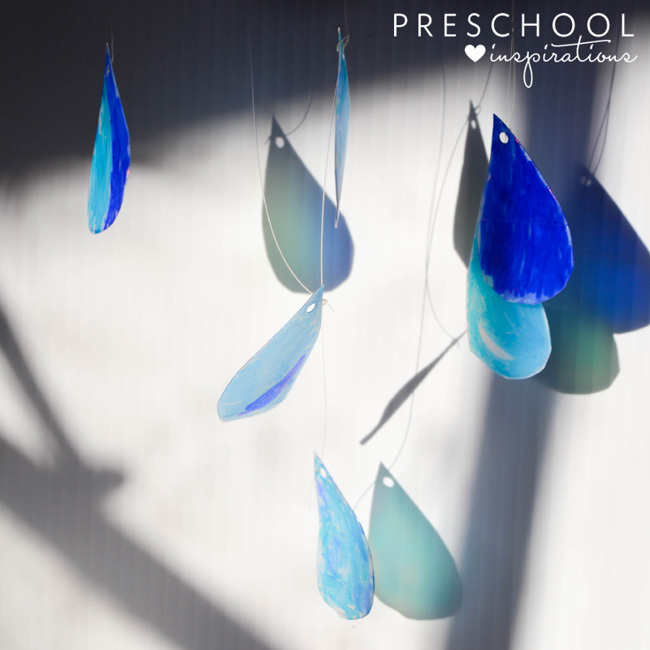 We hope you enjoy this suncatcher craft as much as we did. 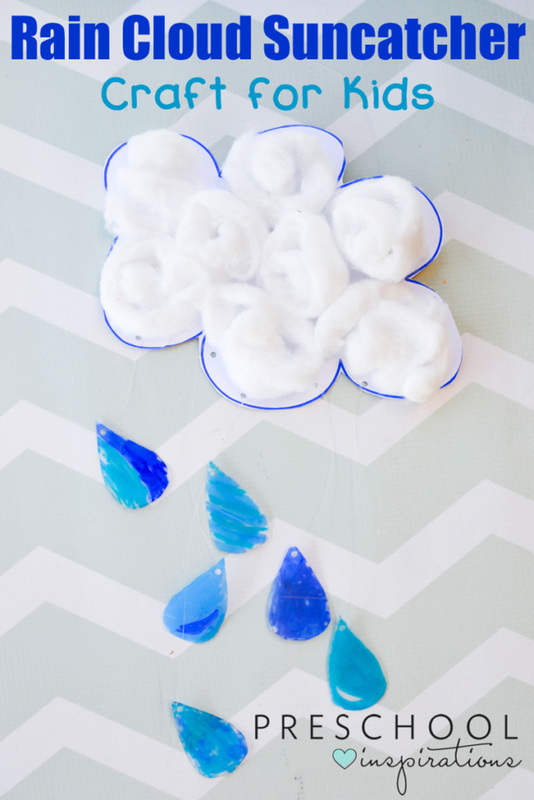 When it gets cloudy outside where you are, you can enjoy our own little rain cloud inside with the kids. Katie is a homeschooling mom of two that loves to come up with educational activities, printables, and crafts, to keep her kid’s learning and having fun. She believes her children make every moment perfect. You can see all of her creative ideas at A Little Pinch of Perfect.com and you can connect on Facebook and Instragram.